All toddlers are huge fans of Sesame Street, and especially Elmo:)! Amongst all our Elmo books, this one is my favourite. 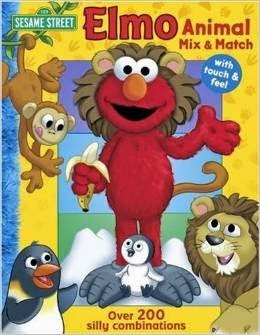 It is an oversized board book with lots of big colourful pictures and rhyming stories on each page about Elmo. Each page is cut into three strips so that you can easily mix and match all the character faces, bodies, feet, etc. On each page Elmo dresses up as a new character: lion, bear, elephant, etc, and there is a touch and feel section on each of the characters. Even my preschooler still loves reading this book!